Despite knowing exactly what its makers are getting at, it is hard for anyone to regard Suburbicon as anything else but deeply flawed. Directed by George Clooney from a Joel and Ethan Coen screenplay, the film which is set in the 1950s and deals with issues relating to preconceived notions in white America, attempts to be daring in more ways that you can imagine, but ultimately fails to fully convince even those of us who were rooting for it from the start. 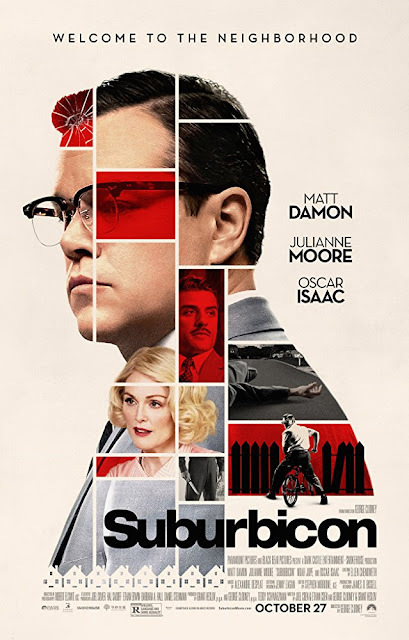 Set in what at first appears to be an idyllic, predominantly white middle-class town, the film attempts to tell two separate stories which take place in two neighbouring homes over a short period of time in the aptly named town of Suburbicon. Matt Damon is Gardner Lodge, a white-collar middle management bozo who’s life comes crashing down with the bang after getting himself deeply entangled with a murky criminal underworld in order to fulfil his inner most wishes. The film which also stars Julianne Moore as Gardner’s wife Margaret and her twin sister Rose, offers an interesting juxtaposition between the criminal ongoings in the seemingly respectable Lodge household and compares it, rather clumsily to what is happening outside the house next door, in which a black family is being subjected to abuse from their angry racist neighbours. While those who are opposed to the new arrivals are seen shouting, ranting and even setting the black family’s car on fire, next door the bodies are piling up unbeknown to those who purport to want to protect the neighbourhood from crime and lawlessness. As director, Clooney does an impressive job at the helm, his ability to capture the period is more than adequate. Borrowing more than a little from Douglas Sirk’s own 50s melodramas, the director is able to convey the era perfectly with the help of Moore and Damon who are as faultless here as they have ever been. While Oscar Isaac puts in a scene stealing performance as a duplicitous insurance salesman, making you wish he had a much bigger part. Suburbicon might seems a little muddled to some, and with reason, but on the whole the story does a good enough job in keeping you hooked till the very end. Its clumsy depiction of a legitimate historical subject might not be to everyone's liking, but it does a decent enough job in bringing said subject to our attention. Suburbicon is a timely film for the Trump era, even if doesn't always get everything right, one cannot help but want it to succeed. Worth checking out for the performances alone.